Dell Venue 10 Pro summary review. I’ve just completed a full in-depth review of the Dell Venue 10 Pro for Notebookcheck. You’ll find thousands of words, lots of pics and many test results here but if you’re looking for my a summary opinion on the Dell Venue 10 Pro, read on. 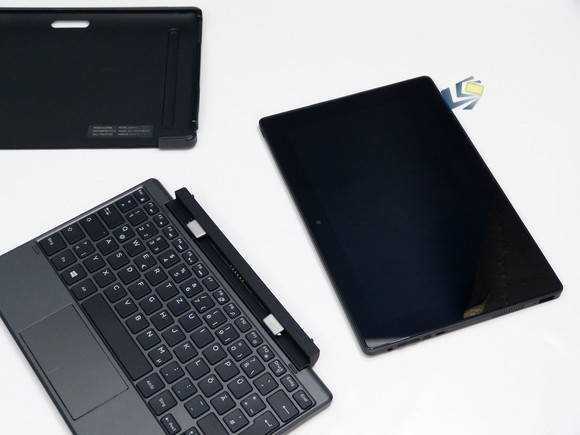 The Venue 10 Pro 2-in-1 is available as a 1366 x 768 tablet but I reviewed the more interesting full HD version with docking keyboard and was very impressed with the build quality and features. It’s clearly for business and education and sacrifices some style to provide a full size USB port, 32 Wh battery and a rubber surround on the casing. The keyboard is great (no battery in this one) and the screen brightness is impressive. I also tested a rubber case for the tablet which gave the device more bulk but increased ruggedness and grip. The Dell Venue 10 Pro has some issues though and the one you just can’t ignore is the 1.5 year old Atom CPU design. 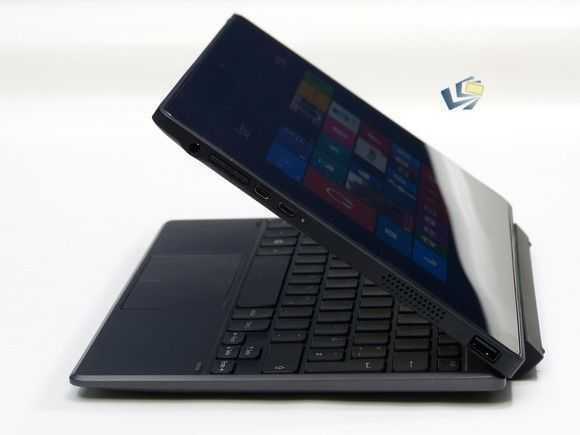 Dell didn’t even chose the high-end version of the CPU – the Z3795 – that you find in other business focused offerings like the HP Elitepad, Fujitsu Stylistic, Lenovo Thinkpad and even the Dell Venue 11 Pro. 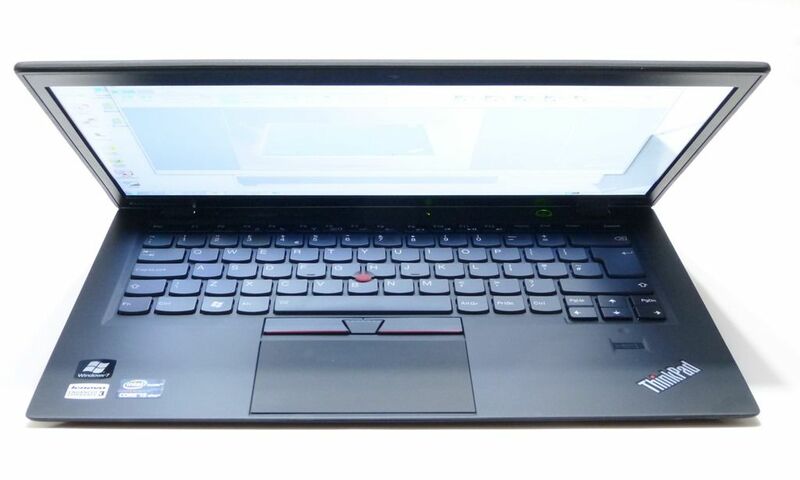 Instead you get the common-or-garden Z3735 which didn’t even outperform a 2014 Lenovo Miix 2 10 that I’ve had for a while. The Z3795 is not only more powerful (with similar CPU performance to the new Surface 3) but it also enables 64-bit operating systems which helps IT departments keep images down to a minimum and enables a range of Linux-based OS alternatives. Venue 10 Pro tablet, keyboard and cover. There are some good security option on the Dell Venue 10 Pro though. I enabled Bitlocker file encryption by using a Microsoft account and noticed that there are BIOS options to disable ports, cameras and features. Where businesses are looking for a data-collection device to use with in-house software, the Dell Venue 10 Pro could be a good value option. Security, screen and ruggedness are top-notch for the price. Total weight is a little on the heavy side and the ‘docked’ thickness is way more than you’ll get with even a Surface Pro 3 and keyboard but you do get a nice keyboard and touchpad and it’s no bigger than a netbook from a few years ago. The 32 Wh battery is worth having too although my review device had lost 16% of its capacity already. Watch out for battery wear if you buy a Venue 10 Pro and return it if you reach 10% wear in 6 months. If Dell upgrade the Venue 10 Pro with an Atom X7 CPU and a slightly faster eMMC disk then we’ve got a winner on our hands but in its current form it’s a product for vertical markets. Maybe that’s why we’re not seeing it in retail channels yet. Reviews Comments Off on Dell Venue 10 Pro summary review. This robust tablet, obviously for vertical markets, was spotted on the stage at an Intel event here at CeBIT. It’s unique, but you just know it’s going to be expensive right? 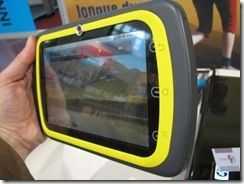 1920×1200 screen, removable battery, waterproof and running on a new Z3745 Baytrail-T 64-Bit CPU. There’s a great selection of ports too. 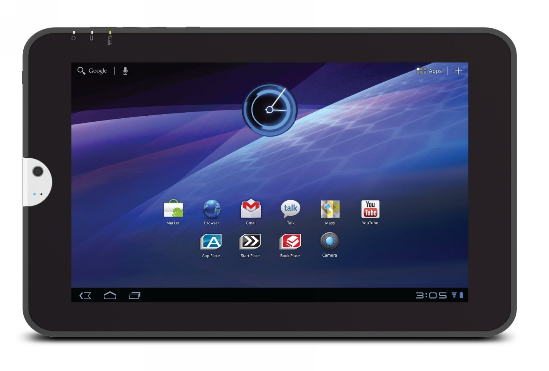 Toshiba has recently jumped on the Android 3.1 Tablet bandwagon with its Thrive offering that is now available for pre-order on amazon.com. 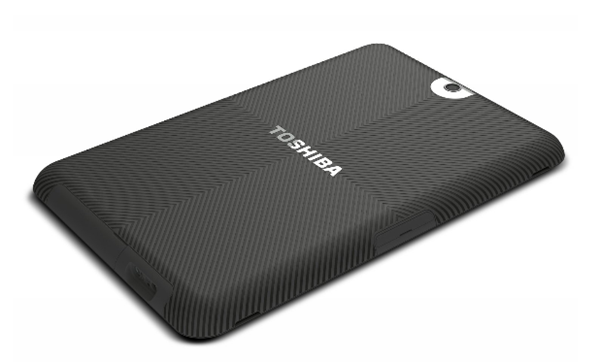 See full specs, links, and more info on the Toshiba Thrive in our device database. The Thrive has a 10.1 inch screen @ 1280×800, flash support, 1G RAM, dual-core Tegra 2 processor and comes with Android Honeycomb 3.1 as its operating system. There are two cameras: a 5MP back camera and a 2MP front facing camera for video conferencing. Before we all throw our hands up in the air and moan about â€œyet another wannabe 10.1 inch Android tablet inch, bear in mind that Toshiba is well known for designing and making quality, sturdy laptops and this tablet looks very solidly constructed and would seem like it can take a knock or two! Having look at the back cover (pictured above), it is made of Easy Grip surface which is textured and looks like it’ll provide you with a great non slippery gripping experience. The cool thing is that this Easy Grip surface is replaceable and you can customize the surface with different colored skins if you wish to stand apart from the crowd. 1) Replaceable battery â€“ I am always a fan of tablets that allows you to replace a worn out battery or carry an additional to extend your road warrioring hours, so big brownie points for Toshiba for this! 2) Connectivity ports galore (picture above) â€“ the Thrive comes with SD slot, mini USB, full sized USB 2.0, and a full sized HDMI out, again, another standout inclusion. I really like that the two most commonly used connectivity interfaces are full sized and you don’t have to hunt around for mini or micro HDMI cables (eg, Acer Iconia and the Asus eeePad Transformer). There’s even a dust cover to protect the slots when not in use. 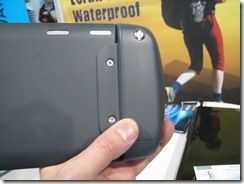 Lack of ports is one of the biggest threats to the HP TouchPad. The Thrive will come in three models, for the budget conscious: 8GB ($429.99), 16GB ($479.99), and the top of the range 32GB ($579.99). These capacities are currently available as WiFi-only but Toshiba has said that they will be releasing the 3G or 4G versions shortly. Toshiba has certainly made the effort to ensure that the Thrive tablet doesn’t become ‘just another 10.1 inch tablet’ with some great attention into its design. The ultimate sacrifice that manufacturers, such as Toshiba, are making by offering full sized connectivity interfaces and replaceable batteries will be the size and particularly the thickness of the device — it can never come close to being as wafer thin as the iPad2. Still, the Thrive may win the hearts of road warriors like me that need a productive tablet that can interact with other devices and peripherals. As I watched the continuing catastrophe in Japan today I imagined how important rugged technology is in these tough conditions and I thought back to a device I had seen at CeBIT. I searched through my YouTube videos and realised that I hadn’t even posted the video yet. 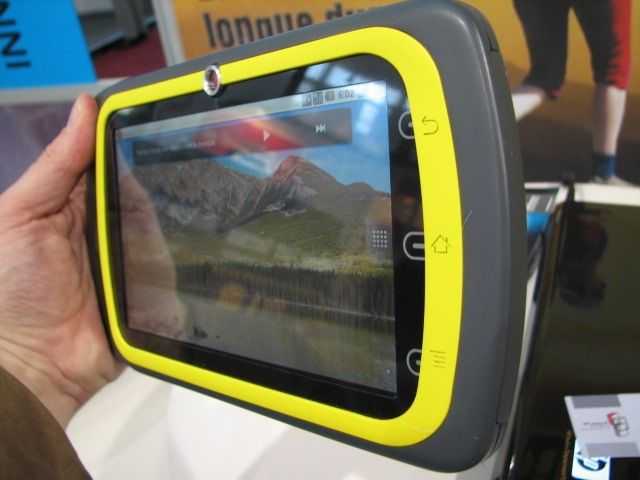 The prototype ruggedized Android Tablet from Mobile Tout Terrain shown in the video below and in the gallery here is not certified for the sort of environment we’re seeing in north-east Japan right now but it’s certainly more rugged than your average tablet or ultra-mobile PC (UMPC.) Think about hiking, traveling, the beach, your bike and even extreme situations like baby drool or even, and this is one I’m interested in, the bath! 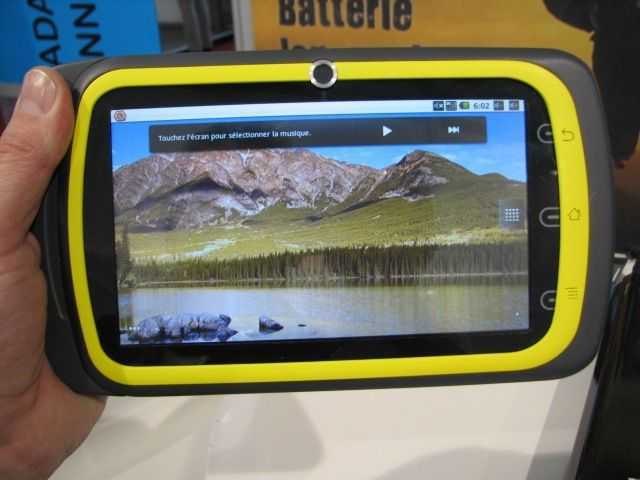 Mobile Tout Terrain, a French company, are aiming to get this IP67-spec tablet ready for Q3 2011 at a price that sounded wrong. 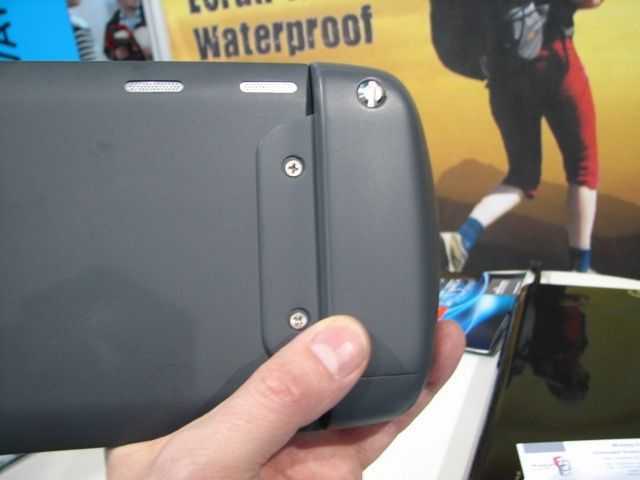 â‚¬350 sounds way too low for a splash-proofm dust-proof device. 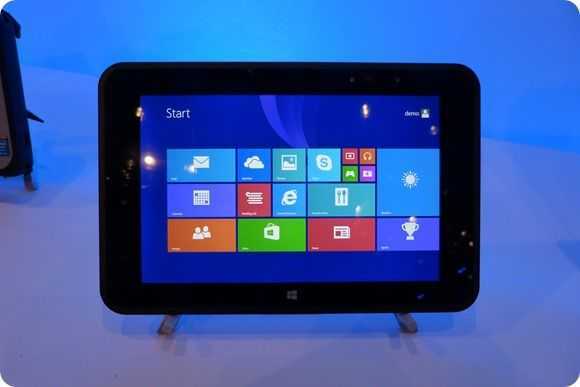 Specifications and pricing are subject to change but we’re looking at a 1.2Ghz CPU (of unknown type) and an 800×480 multi-touch capacitive screen. There’s no telling what version of Android will be on it in 6 months time but we heard that 2.2 is being worked on. GPS is included, micro SD, 512M RAM and Web Cam. Styling work is planned for the connector/holding block but as it is, I found it incredibly easy to hold in landscape mode. Extremely important for this, even critical, will be that it has a full Google suite of applications. Without Google Maps, Talk, Latitude, SkyMap and all the other great applications available through the market this will only be interesting for companies wanting to develop their own applications. Mobile Tout Terrain may just be aiming for such a niche of tour-guides, meter-readers and surveyors but I really hope not because there’s so much more this device could do. I’m sure you can think of a huge list of applications here. We might still be waiting to hear more news of the Side Arm 2 rugged UMPC, but in the mean time it seems like we have a different rugged ultra mobile PC to take a look at. 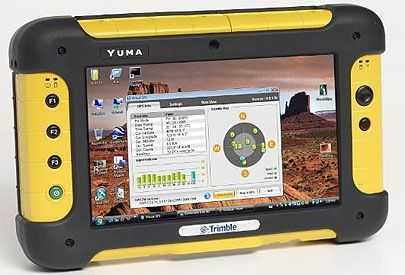 Have a look at the Yuma rugged ultra mobile PC from Trimble. Panasonic CF-U1. Brief hands-on. 8hrs of Menlow-based Pro-Mobility. 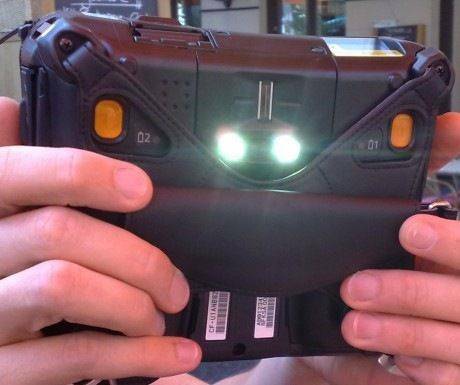 Dual, hot-swappable 20Wh batteries. Now that’s a feature I want, with an external charger. Dual high-brightness LEDs around the camera. For that night-time report or just to scare young boys! Fingerprint reader for security and speed benefits. Modules all over the place! This one had a laser barcode scanner and RFID reader. Amazing Wifi and Bluetooth reception. I didn’t get a chance to test it out but apparently a lot of time was spent getting it right. The person showing me the U1 [Hi Jason. Thanks for breakfast!] had done some tests to confirm this. 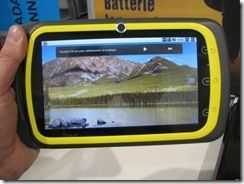 It looks like Panasonic will be releasing that rugged Atom-based ultra mobile PC in the near future. Engadget is reporting that the unit will have a 5.6″ touch-screen, QWERTY thumb keyboard split with a numerical number pad, and unfortunately will be running Vista. I hope they managed to reinforce the touch screen, otherwise it will easily be the most vulnerable part of the UMPC. The device, which was previewed at CeBIT and IDF this year, is said to be getting pricing information and detailed specs on Wednesday of this week. We’ll keep you updated as more info becomes available.